Amjad Ali Khan with Sinfonia Verdi during Roots of Fire. © Boxclever Media. This ground breaking project Roots of Fire took place over a series of concerts in 2016 and 2017. It was produced by the chamber orchestra Sinfonia Verdi and aimed to bring worlds together through music. At the project’s core was the belief that we share the same fundamental musical DNA, and that the same creative spark is at the roots of all of our music. These creative roots ultimately know no boundaries of culture, nationality or religion. Roots of Fire offered a unique opportunity to create music works and education resources that offer new audiences in the UK and India, the opportunity to engage with both Indian and Western music. 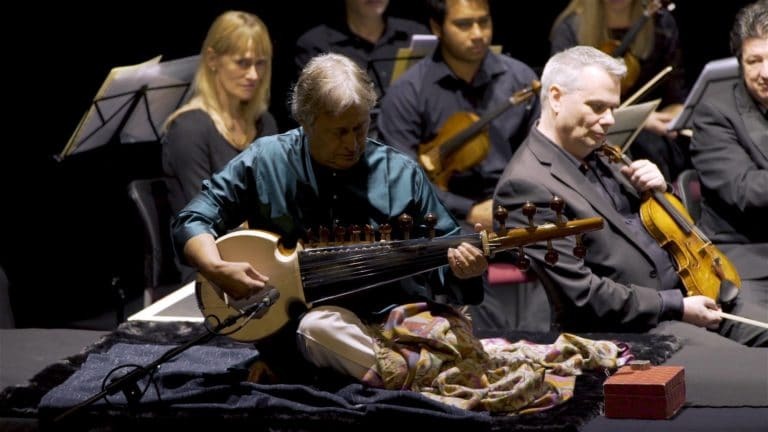 The concerts included master of sarod Amjad Ali Khan and his sons, Sarod sensations, Amaan Ali Bangash and Ayaan Ali Bangash alongside the Sinfonia Verdi orchestra and conductor David Murphy. Launched with the Association of British Orchestras Conference in January 2016, the project operated in Goa and Mumbai in India and Luton, Leicester and Slough in the UK and included musical workshops for children in each city. You can view some extracts from the events on our youtube playlist here. Sinfonia Verdi is based on the border of Bedfordshire and Hertfordshire and has performed throughout the UK and internationally. The orchestra has led on educational projects with various groups from local schools to world-renowned choirs to the corporate sector. With Sinfonia Verdi we also presented, Strauss Reflected, an exciting performance that revealed the emotionally charged lives and works of the Strauss family through Western and Indian classical music and storytelling on 4 November 2017 at Cadogan Hall.